This is a stunning large format Japanese map of eastern Australia dating to World War II. Issued by the Japanese in 1943, this is one of the most beautiful maps of Australia ever produced. It covers the eastern half of the continent including Queensland, New South Wales, Victoria and the eastern parts of South Australia and Northern Territory. 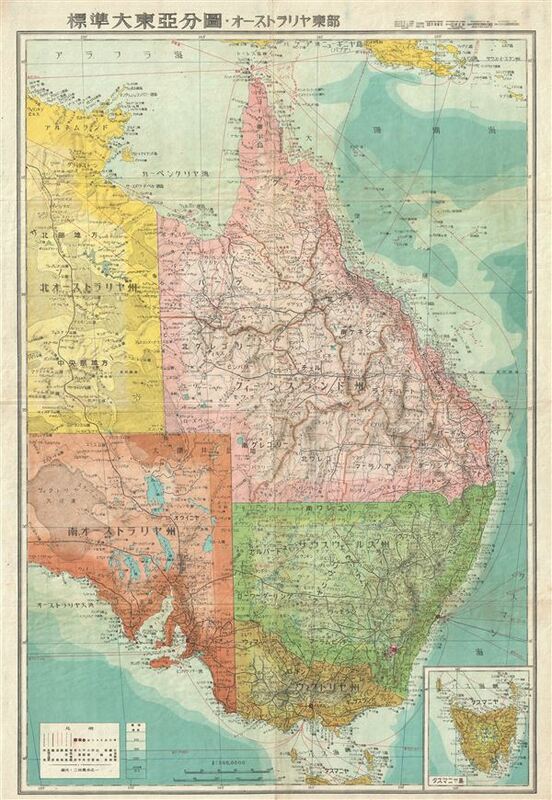 An inset of Tasmania is included in the lower right quadrant. The map offers superb detail regarding both topographical and political elements. Notes cities, roads, trade routes on air, sea and land, and uses shading to display oceanic depths. While Allied World War II maps of this region are fairly common it is extremely rare to come across their Japanese counterparts. All text is in Japanese. This map was created as part of the Series of Great East Asia maps prepared by the Japanese during World War II. This map is no. 16 in that series.